It feels like a super-long time since I last blogged anything. Those darned burglars! What a palava having to locate receipts and passwords and the like. Then wait for the insurance company to either replace or repay. In the mean time I’ve had a couple of commissions to complete …one sweet and one scary. Well, not actually scary, but a little strange. Healaugh Church is located out in the countryside of Yorkshire, just outside York (The old capital city of Yorkshire). It’s a quaint old church with a lovely view across the vale of York. And it has the most beautifully decorated main entrance of a quaint country church. Well, age has not been that kind to it and much of the intricately carved stone has been weather-worn away. 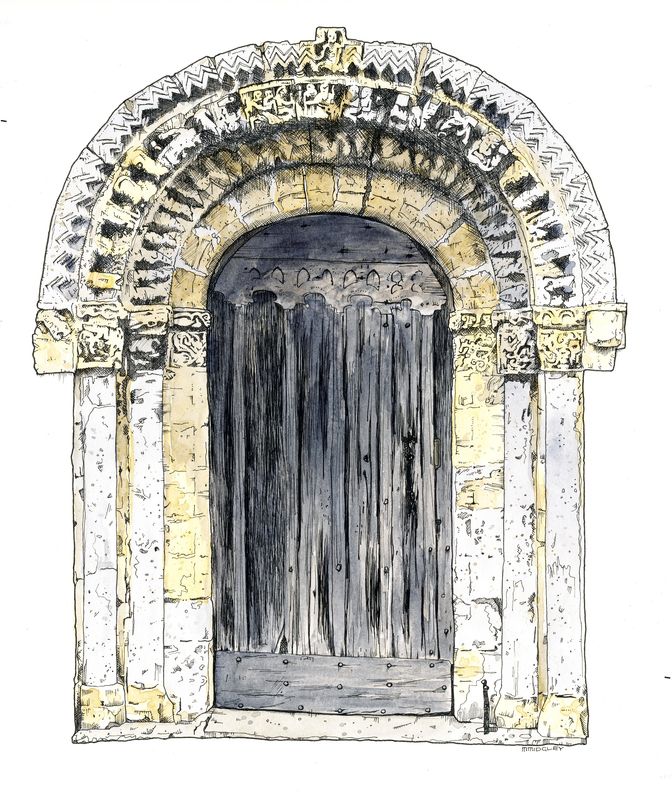 A colleague at work asked me to draw to draw the main doorway as a gift for some friends. I have to admit I kind of fell in love with this doorway myself as the drawing progressed, and when it came to handing the drawing over I was quite torn.